Our athletic injury series this week covers lateral ankle sprains, also known as inversion ankle sprains. Lateral ankle sprains are pretty common in both the athletic and general populations. There are some studies that have showed this specific type of ankle sprain make up 15-20% of athletic injuries. Have you played a pickup basketball game and rolled your ankle? Have you tried to cut on your leg and your ankle buckled inward? Then it’s likely you’ve experienced this type of injury. We are going to cover a number of different things to consider! Anatomy, why lateral ankle sprains occur, and recovery methods are just some of the topics we’ll touch on. The main bones of the lateral ankle and foot we are going to discus are the fibula, the talus, and the calcaneus. These are the main areas of where the ligaments of the outer ankle attach to. There are three main ligaments on the outer aspect of the ankle that are involved. Of those 3 ligaments, the anterior talofibular ligament (ATFL) is the most common to be compromised in this injury. The second most common ligament to be involved is the calcaneofibular ligament (CFL), and then lastly the posterior talofibular ligament (PTFL). Don’t be mistaken, all 3 of these ligaments can sustain trauma regardless of the severity, but lower grade sprains will stress the ATFL most. Lateral ankle sprains normally occur when the foot is in a downward (plantarflexed) and inward (inverted) position. Landing on someone’s foot while playing basketball, stepping off of a curb wrong, or trying to stop quickly and your momentum causes excess strain on the outer ankle are just some examples of how this injury occurs. I should put a disclaimer in saying that whenever someone says a ligament is torn, they aren’t wrong, but there needs to be more context. Ligament sprains are microtears to the ligament. Ligament sprains are graded on a scale from 1 to 3, and although there are general timetables for recovery, everyone is different and unique. Another thing to consider is whether or not this is their first time sustaining the ankle injury or if they’ve sustained multiple ankle sprains in the past. Understanding this will help set expectation when going through the recovery process. The first step when dealing with any ankle sprain is to rule out the possibility of a potential fracture. The Ottawa Ankle Rules are a great indicator to determine if further diagnostic testing is needed. In most cases, diagnostic tests are not warranted. However, there are times when people think it is just an ankle sprain only to find out they have an associated fracture as well. 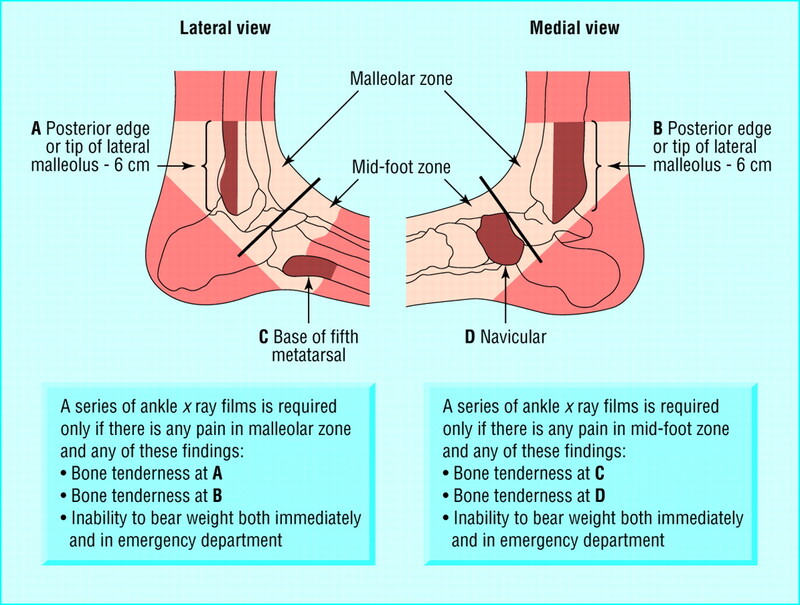 Looking at the graphic below, if you have discomfort in any of the zones mentioned, or can’t put weight on the ankle immediately, then x-rays should be pursued. This can help expedite the process when knowing exactly what you are dealing with. The balance training is a crucial component for inversion ankle sprains. There are many tissues in and around the ankle that help you perceive where you are in space. The inability to tap into those tissues is what can predispose an athlete to another injury. Ankle sprains can be tricky. Although low grade severity lateral ankle sprains seem harmless, those are the ones that can lead to recurrent ankle sprains. Getting an athlete up and stressing the tissues in the foot and ankle is crucial for a full recovery. Always rule out a fracture first, and then determine the severity to figure out where the recovery process should start. If you have any questions, feel free to reach out to us!